15 ounces of Premium Food Grade All Natural Xanthan Gum. Its unique ability to hold small particles of food together makes it the ideal substitute for gluten in gluten-free baking. 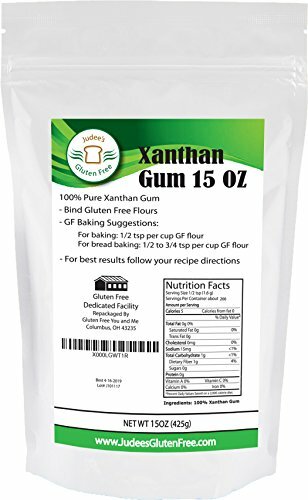 We use this Xanthan Gum in all our Gluten Free Bakery products here at Gluten Free You and Me. Xanthan gum is a very versatile ingredient and has many uses both in modernist and traditional cooking. It is also very easy to work with. Xanthan gum is great for thickening liquids, especially in small amounts, to turn them into flavorful sauces. It also can be used to create light foams and froths.. You can use it as a thickener, stabilizer, emulsifier, suspending agent, or bodying agent in many food applications such as salad dressings, sauces, gravies, instant products, desserts, bakery, dairy products, and fruit juices. For example Xanthan gum can be used as an ingredient to make gluten free worcestershire sauce, tarter, cocktail, pizza sauces, and barbecue sauces. Xanthan Gum prevents ice crystals from forming in ice creams. Xanthan Gum also provides a 'fat feel' in low or no-fat dairy products. In cosmetics and personal care products, Xanthan Gum may function as a binder, emulsion stabilizer, skin-conditioning agent, surfactant - emulsifying agent, or viscosity increasing agent The many cosmetic and pharmaceutical applications of this Xanthan Gum include the use in tooth pastes, lotions, shampoos, and formulations for tablets. ★ Excellent as a thickener for making gravies, sauces, soups, or salad dressings. Binds Gluten free flours and is used in all our Gluten Free Baked Products. If you have any questions about this product by Judee's Gluten Free, contact us by completing and submitting the form below. If you are looking for a specif part number, please include it with your message.